Haliburton, Sept. 13 (PNS)—Pte. Bernard Davidson is among the latest casualties reported in this area. Full details are not available and all that is known is that he was wounded while serving in France. "Bubbles" as he was more familiarly known, was a favorite among villagers. Several men, some of them veterans of the invasion of Normandy are expected to arrive in Haliburton within the next few hours. Cpl. Bernard Davidson, son of Mr. Thomas Davidson, Haliburton, is among those whose arrival is awaited. He was wounded in his right arm while serving in France. He has recently been confined to an English base hospital. February 24, 1945 Mr. Thos. Davidson is in Toronto this week and expects to meet his son, Cpl. Bernard, who is arriving on the hospital ship, Lady Nelson. Cpl. Davidson was wounded last summer. His brother, Lieut. Ross Davidson was killed in action Jan. 29th of this year. 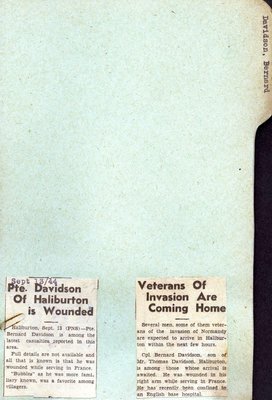 The missing clipping that is mentioned here was erroneously attached to Bernard Davis' card.